Aquatic & Leisure Centre in Adelaide when he makes his Australian comeback next year. The centre will host the 2012 Australian Swimming Championships, incorporating selection for the 2012 London Olympic and Paralympic Games. When fitting out the centre they realised they needed a range of custom made seating that was not only functional and brightly coloured, but could also survive in a chemical rich environment without rusting or deteriorating. Over $40 000 worth of recycled-plastic seating from Replas was installed in the $100 million dollar centre. 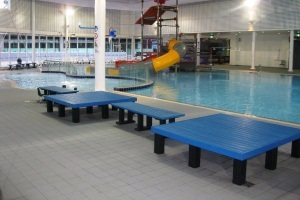 ‘Using REPLAS products was the obvious choice bearing in mind the environment they needed to be in, I will only use REPLAS products in all of my pools because they are the only product that will survive the test of time.’ Michelle Young, YMCA.